DAVE GILBERT: San Diego’s water supply is getting dangerously low, what do we need to do to fix that? JIM BELL: As it turns out I’ve just completed an article on this subject which I’m just starting to release for general publications. Even if we assume the worst case scenario of zero precipitation and the complete cutoff of all imported water, the San Diego/Tijuana Region could completely replace all the freshwater it currently uses by installing PV panels over 4.3% of its roofs and parking lots. In 2050, 2.3% of our region’s roofs and parking in 2050 will be about 12 sq. miles. Similarly, since “waste water” from the RO process will be twice as salty as seawater, it will have to be diluted by mixing it with seawater, also extracted from the near ocean wells, until the water to be returned to the ocean is no more than 20% saltier than seawater. Once diluted, its release into the ocean would be defused as an additional precaution against negative ecological consequences. Mining the saltier RO waste water for salt and other minerals opens up other local business and employment opportunities for the Region. 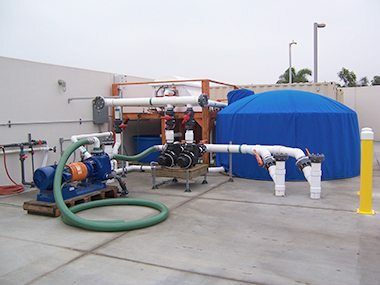 The size of the “worst case scenario” RO system discussed above could be cut in half, if recycled sewage water was filtered and disinfected, then used for irrigation. Using graywater at home would also be a plus. This is because half of the potable water currently used in our region is used for irrigating landscaping and crops. good article. i spent most of the last decade living in the Caribbean, where most of the water was supplied by reverse osmosis. it’s totally practical to do this. btw-the taste of the water is excellent. Just an interesting sidenote. 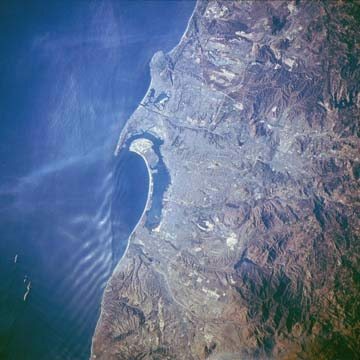 Back in the early 1960’s, Point Loma had a sea water conversion plant feeding about a million gallons a day into the city water supply. It was located between the Coast Guard lighthouse and the tidepools parking lot on the west side of Cabrillo National Monument. In 1964, the whole plant was disassembled and shipped off to the US base at Guantanamo Bay, Cuba, after the Cuban government cut off the water supply to the base. We had desalinated water 45 years ago, why can’t we do it now? San Diego is growing, but those pipes across the desert aren’t getting any bigger. That’s not fixing the problem. Newer Article: Why has America’s response to ‘Tent Cities’ been to send in the police who slash up the tents?